A temple headache is on the side of your head... over your temples. These headaches are most often tension headaches, although they can be migraines as well. Frequently, they are caused from excessive jaw tension and may be related to TMJ (temporomandibular joint) problems. 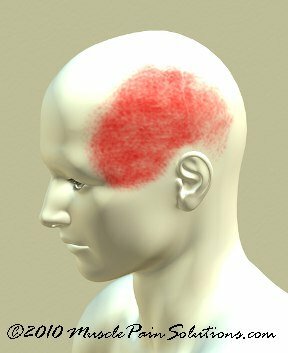 (See this page on TMJ headaches). Often, these problems can be alleviated through self massage. On this page, we will go over the main muscles that refer pain to that area. Fortunately, this is the most common cause of pain in this area. If you have not already learned about trigger points and how to treat them, Click here. It is worth a shot to check these muscles and treat what you find to see if it will help you with your temple headache. The following chart is a quick reminder for easy treatment of trigger points. For more complete info, check out the self massage page, or try the other method: Deep Stroking Massage. These muscles are listed in the order of most common to least common causes of temple headache. There are brief descriptions below with a link to an image of the muscle. Trapezius — This large muscle, called trapezius for it's shape, is very complex and has a number of trigger points. Trigger point #1 is located right where the neck meets the shoulder and can refer pain to the temple. Pinch the small roll of skin right where the shoulder joins the neck. It feels like a tight band and sends pain to the temples, angle of the jaw, down the neck behind the ear, deep behind the eye, and to the back of the head. The other trigger point in the Trapezius muscle send their pain to the back of the head. For a picture of this muscle, click here. Sternocleidomastoid (SCM) — This is a very interesting muscle that can create a whole spectrum of problems, from dizziness and nausea, to ear ringing, and even ear headache pain. The muscle runs from the skull behind the ear to the top of the breast bone and to the collar bone. The trigger points are located along the whole length of the muscle. For more complete info on this muscle, click here. Temporalis Muscle — This is a flat muscle on the side of the head above the ear. It mostly creates pain in the side of the head but can extend to the back of the head. This muscle can even create tooth pain. The trigger point that refers to the back of the head is above the ear to slightly behind the ear. These trigger points can be activated by clenching/grinding the jaw, dental work, excessive gum chewing and forward head posture. Click here for a picture. Semispinalus capitus and splenius cervicis — These are complicated little muscles in the back of the neck close to the spine that can create pain in the back of the head and even into the forehead. They don't like it when you bend your head forward for long periods of time (such as studying, reading, and writing). A tool like an Easy Reader, that props your book up at an angle, can reduce the strain on these muscles. To work on them, just feel along the spine in the neck to see if you can find any spots that are tender, or recreate the feeling of your headache. Click above on the title for the pictures. Suboccipital muscles — These are a set of very small muscles at the base of the skull. You can find them by poking right below the edge of the skull in the back. They extend from behind the skull all the way to bottom edge of the skull right behind your ear. They frequently refer their pain to the side of the head and behind the ear, but also can create pain at the back of the head. They are stressed by activities that require you to extend your head or look up. This can happen when someone lies face down on the floor and then props their neck up their hands to watch TV. It can also happen with poorly adjusted bifocals, or forward head posture. Click here for a picture of these muscles. Check out the page on Headaches to see what type of headache you have and get more tips on reducing or eliminating these annoying temple headaches. Return from Temple Headache to Home.